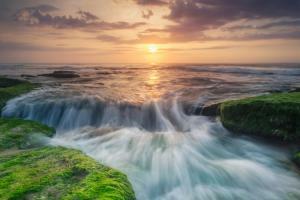 The world we live in makes it hard to unplug and enjoy the beautiful wonders that surround us. A great way to take in natural wonders, find peace and observe exotic (yet friendly) wildlife is through travel. 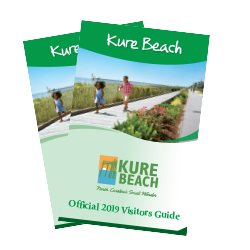 From taking a nature excursion along an unspoiled shoreline to learning about marine wildlife while pedaling your way across town, there are plenty of ways to unplug and take in natural wonders rarely seen during an eco-adventure at Kure Beach. Once you cross the bridge from the mainland, it’s easy to get around the island without a car. Explore by bike – rentals of several varieties are available at Fort Fisher State Recreation area through Paddle NC. 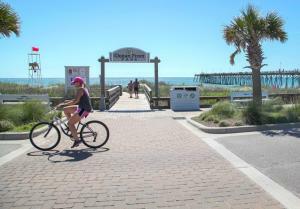 While on two wheels, explore the golden hour at the Kure Beach Fishing Pier or pedal down the peninsula of unspoiled shoreline to see historic Civil War sites. Show your support to restaurants recognized by the Plastic Ocean Project as Ocean Friendly Establishments on the island, including Jack Mackerel’s and Shark Bites Snack Bar. 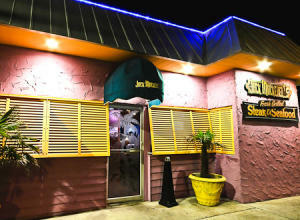 Right off the ocean, Jack Mackerel’s serves up Caribbean-inspired dishes filled with flavorful and colorful ingredients. Shark Bites Snack Bar is the perfect place to grab a bite to eat like nachos, pizza and sandwiches before or after touring the North Carolina Aquarium at Fort Fisher. There is an abundance of natural wonders to explore at Fort Fisher State Recreation Area. One of the most unusual areas of North Carolina’s coast, Zeke’s Island, is located nearby and only accessible by boat. The reserve features dynamic landscapes like tidal flats, salt marshes, shrub thicket, maritime forest, sand dunes and ocean beaches that set it apart from other areas. Wildlife also has a huge presence there. Dating back thousands of years, Kure Beach’s coquina rock formation is only visible at low tide. This unique formation is host to a rare mossy hard rock outcrop cemented together by seashells and coral. Over the years, these shells have created a perfect area to spot marine life such as sea stars, hermit crabs and conchs. Kayak Carolina offers daily rentals and guided tours of the surrounding areas, like the Zeke’s Island Family Adventure Tour or the nearby Sugarloaf Dune Hike and Paddle. New Hanover County has nine sites on the N.C. Birding Trail. Mahanaim Adventures in nearby Wilmington offers Birder Kayaking Adventures to Fort Fisher Basin, Zeke’s Island Reserve and nearby Carolina Beach State Park where bird species likely to be seen include great egret, white ibis, bald eagle, great horned owns – the list goes on. It’s easy to get educated about a variety of environmental issues thanks to local organizations and programming. The North Carolina Aquarium at Fort Fisher offers a variety of Ecology programs and events throughout the years, as well as summer camps for kids. Learn about the Aquarium’s conservation efforts, which are currently focused on three vulnerable animal populations: sea turtles, amphibians and sharks. The Pleasure Island Sea Turtle Project is dedicated to preserving and protecting all sea turtle species. The group is composed of volunteers who patrol the beach, cover and protect nests, dig trenches to the ocean, and guide hatchlings through the trenches once they are ready for their journey. The non-profit offers Turtle Talks throughout nesting season (May through September) at several island locations. 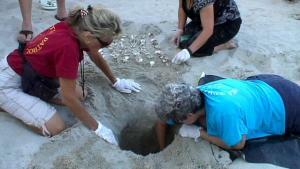 Or you can lend a hand to the volunteers on the beach during your upcoming trip.